What’s your baby’s technique? Are they a kicker, roller, flipper, bouncer or jumper? Huggies Little Movers Slip-On Diapers make it easy to change any type of squirmy baby with the dependable leakage protection of the Huggies brand. Not only are they easy to slide on, but taking them off is just as simple with a tear side. These diapers really are great for on the go changes. In fact, they take half the time to put on than a normal diapers, saving all of us busy moms lots of time, especially when we’re on the go and there is no good place for our little toddler to lie down. Also, I was thinking these Slip-On Diapers will make the transition in to real undies with Timmy just a bit easier, as soon as he’s ready to potty train, being that they are very similar to the big boy undies his big brothers wear. I’ll be sure to keep you posted! You can watch videos of real families and their babies share their stories about diapers and putting Huggies Little Movers Slip-On Diapers to the test. 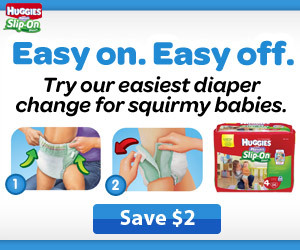 Share the Huggies Easy On, Easy Off Challenge page with 3 of your friends and get a coupon for $2 off a pack of Huggies Little Movers Slip-On Diapers. Switch to the slip and save today!